Unexpected places A prison in England, a border check-point in Bosnia, Singapore with its culture clashes, even the inside of the human body – these were some of the unexpected places to which listeners were conducted as poets read their works at the Ars Interpres Poetry Festival held in Stockholm from October 4 to 6. This was the third such festival organised by Ars Interpres, the Stockholm-based publisher which has just brought out the most recent number (a double issue, numbers 8 and 9) of Ars Interpres, its journal of poetry, translation and art. The most unexpected place As at the first two Ars Interpres festivals, also held in Stockholm, listeners were treated to a stimulating mix of recognised poets from Sweden and around the world, reading primarily in English. There are those festivals and literary events that find their form and then go on repeating it. Not so Ars Interpres. This time, the festival's literary feast was enriched by a new element, a 'first' – not only in the context of Ars Interpres festivals but, one suspects, also in the general Stockholm literary scene, for in addition to presenting poets from the English language sphere, from Eastern Europe, Southern Europe and Scandinavia, Ars Interpres had invited poets from Singapore – four of them! 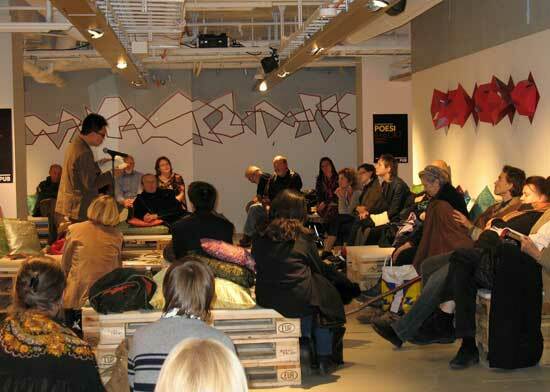 Singapore poetry in Stockholm? It was already clear at this festival's first session, held at the PUB department store on its newly renovated third floor, that Singapore poetry is neither mysteriously foreign nor exotically quaint. It is modern-day English-language poetry that grapples with modern issues and with cultural tensions. It can be wry, is often humorous and is utterly contemporary, albeit with a hint of South-East Asian savour. In the Ars Interpres double issue which had its official release during the festival, these poets also appear, as well as other Singapore poets. Here too there is an illuminating article, "Introduction to Singapore poetry", by Toh Hsien Min, an influential Singapore literary figure. Here we learn that Singapore English-language poetry has already arrived at its fourth generation of poets! Read the article. Get acquainted with the poets. This is definitely recommended reading. The language aspect: English and more Among the poets, some fourteen in number, there were many who had roots or extended experiences in more than one country or culture. 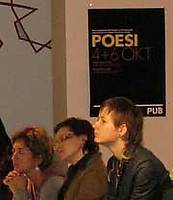 The primary language of the festival being English, many of the poems were thus presented in English translation. There were interesting solutions as to how the language challenge could be met. Ulrikka S. Gernes of Denmark read many of her works in English translation, but others were presented in Swedish and in Danish. Antoni Albalat read his texts in Catalan, with translations into English that at times were interspersed line by line, read by Lars Palm. Swedish poet Lasse Söderberg also used this method, reading selections from Stenarna i Jerusalem (Stones of Jerusalem) in short Swedish sections, followed by his own English versions. Valzhyna Mort, who writes in her native Belarusian, gave a powerful reading of her works in English translation. Mario Sisko has published many volumes in Croatian but now lives in the United States, and also writes and reads his poems in English. A special sense of places, a sense of special places With Tim Liardet we entered the world of men's prisons and were reminded of the possible criminal residing within us. With Mario Sisko, survivor of the war in Bosnia, we felt the helpless fear of bus passengers at a border check-point. With Patty Crane we experienced various gentle aspects of a New England woodland, yet could sense other, perhaps darker, dimensions. Yeow Kai Chai gave us seven poems inspired by the speakers in Hyde Park set off by snatches of the music of a Welsh group. We were in Jerusalem with Lasse Söderberg. We had language problems in a Greek restaurant with Dipak Mazumdar. We entered the world of our own DNA with Ulrikka Gernes ("On the Stairwell"). Even endoscopy became a vivid metaphor in Petter Lindgren's "Klondyke". Intriguingly varied fare With fourteen very different poets on the festival menu, the fare offered had to be varied, and varied it was. Toh Hsien Min stood on the auditorium stage of Nordiska Museet on 5th October and methodically peeled a Clementine as he recited from memory "Peeling a Clementine". Yeow Kai Chai, editor of a newspaper entertainment section, read works intentionally spangled with modern jargon and phrases from pop culture, but could also write about the death of his grandmother. Indeed, at least four of the poets read works having to do with their parents, grandparents and mortality. Old and new, East and West, were elegantly put before us by Heng Siok Tian as she read her "Shakespeare Garden", which is also the title of Ars Interpres' number 9. And humour too! There was humour in abundance. Lars Palm read a number of his disarmingly short poems with their slightly quirky wit. Subtle humour informs much of Yong Shu Hoong's work, as we could hear in his poem on teaching, and in "Retail Therapy". Antoni Albalat's poems span a broad range of humour. We were treated to a hilarious mathematical formula drawn from farmyard life. Another of his poems closes with the repeated squawking of a hen, performed loudly by Albalat and repeated by his English reader, Lars Palm, with energetic good will. This double performance, executed at the festival's fourth and final session, was in itself a humorous contrast to the candle-lit elegance of Berns Salongers' Strindberg Room. One looks forward to the next Ars Interpres poetry festival. Expect more of the unexpected.